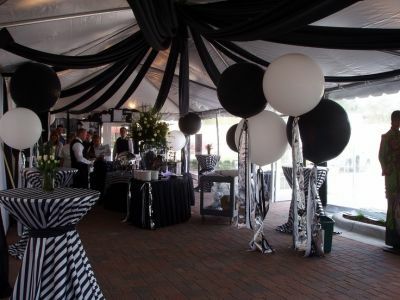 50th birthday party themes are one of the most important decisions of the party. Why? It makes the rest of the planning so much easier. It narrows the search for your party needs and brings all the details together. 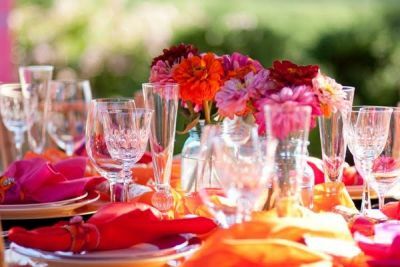 Whether hosting a backyard picnic or an elaborate golden sit-down dinner, keep the party focused on your selected theme. Envision what you want your themed event to be like--use your imagination to take a mental journey through the celebration. 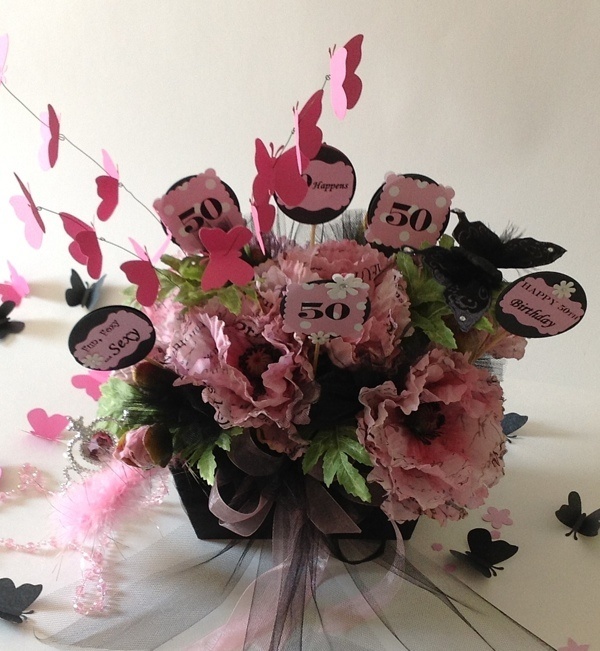 From the invitations to the party favors, bring 50th birthday party themes to life with carefully chosen items. It is never one thing that makes a successful party, it's the whole experience that marks a lifetime of memories. the hope of even better days to come? When someone gives you fifty good reasons for a party, make it a golden celebration. This outdoor setting strikes gold with elegant tables scattered underneath sparkling lighting for all who are present to enjoy it. 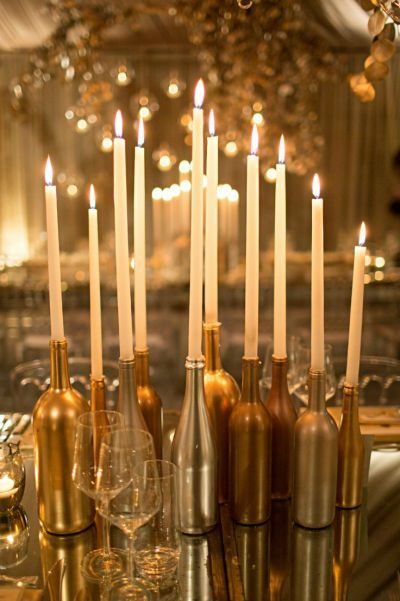 This gorgeous grouping of candles nested in wine bottles provides a touch of glamour. Sitting pretty as part of the decor, they also provide a golden opportunity to be used as party favors. 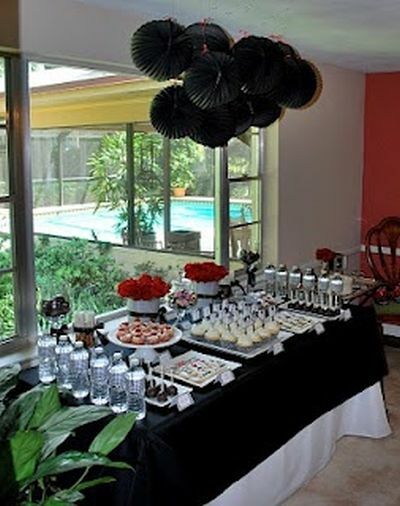 For a truly special occasion, every element of the decor becomes an opportunity to shine. 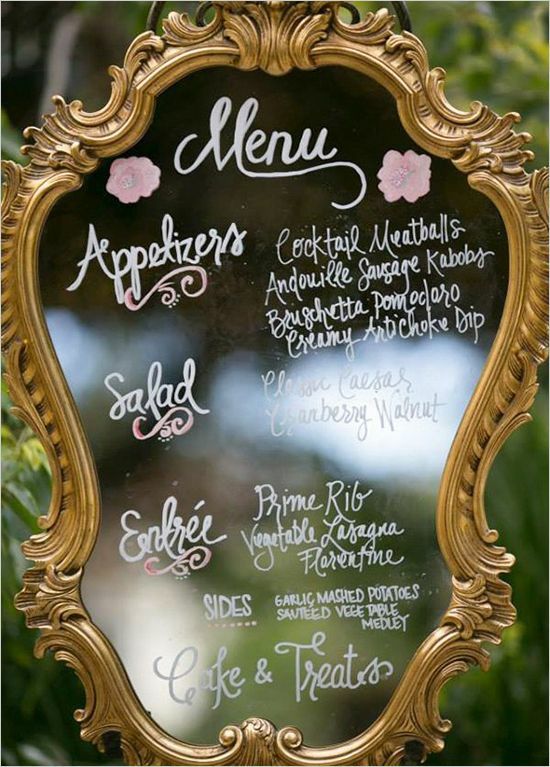 Here, the menu is gracefully inscribed on a gold mirror to give guests an idea of the fine meal to come. 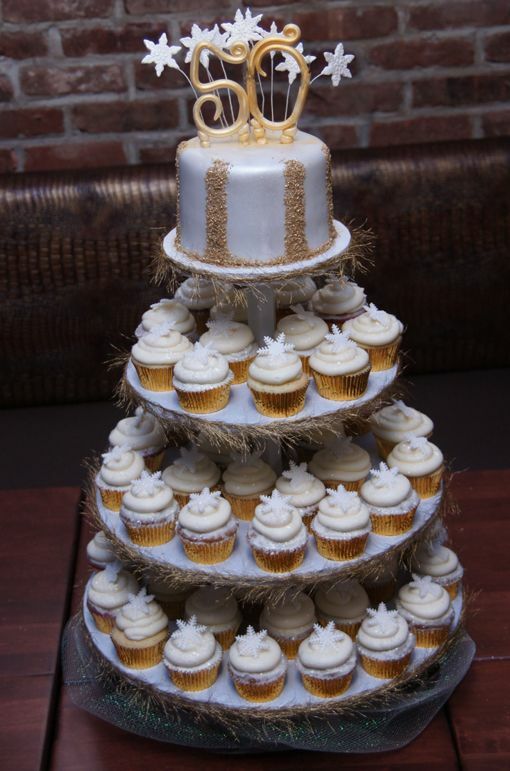 The easy on the eye elegance of this cupcake presentation is worth its weight in gold. Your guests will appreciate the artistic beauty of these 50th birthday cupcakes. 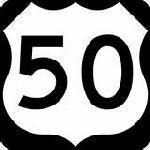 A 50th black out party is a celebration with a new name for the old standard over-the-hill theme. 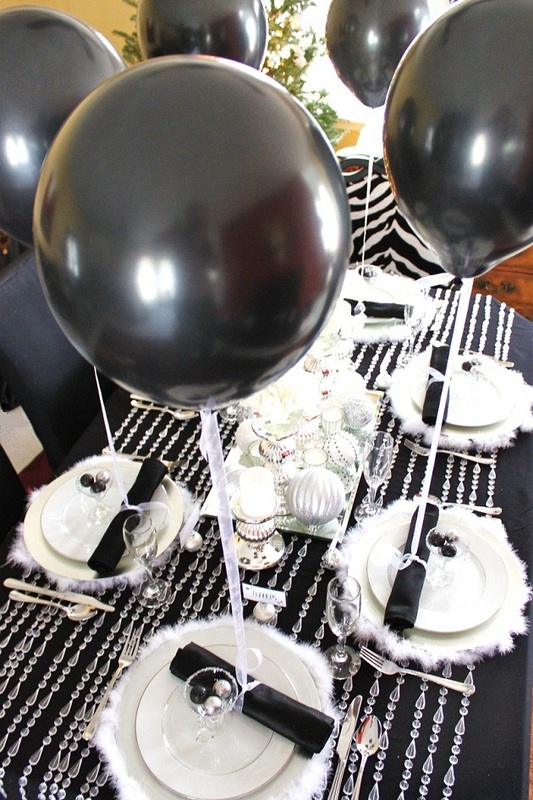 With the color black signifying the passing of youth, it is easy to infuse into 50th birthday party themes. A black color theme makes the contrasting elements stand out magnificently. Here, the red flowers provide an unexpected pop of color to create a dramatic effect. This formal look revolves around a tuxedo backdrop, a tribute to the Honoree and the style of the party. Adding silver and gold decorative details make it all the better for showing off in a creative way. Carry the black out party up a notch with a mock funeral. 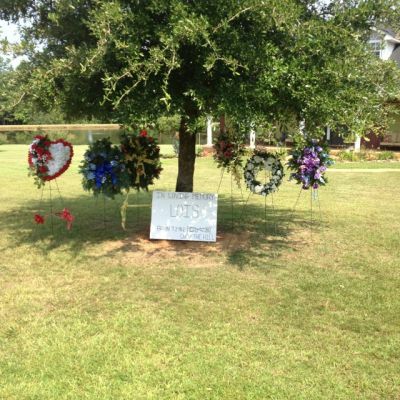 Decorations could consist of gravestones and other funeral effects. Ask guests to come dressed in black ready to mourn the passing of the Honoree's youth. 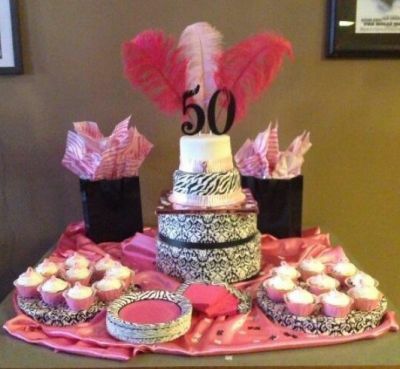 Fabulous 50th birthday party themes are an excellent opportunity to bring on the revelry with color. Here, a wide array of bright and happy colors sets the mood for fun. By combining pink with chic black and white patterns, the essence of fabulous is captured-both in color and in style. 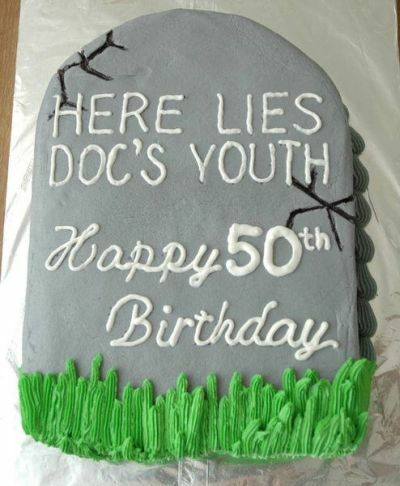 The four-tiered birthday cake is an irresistible tribute to 50. Experimenting with new styles and adding meaningful touches can make even the most expected look seem fabulous. 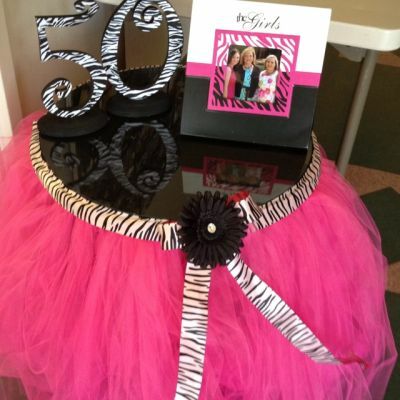 Perhaps most striking, along with zebra print, is the hot pink tutu skirt. Celebrating 50 years in pictures. 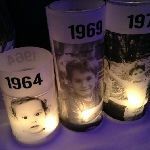 This centerpiece idea provides a way for everyone to celebrate each and every year along the journey of life. Personalized candles and pretty flowers lined up down the center of the table bring ambiance along with a trip down memory lane. 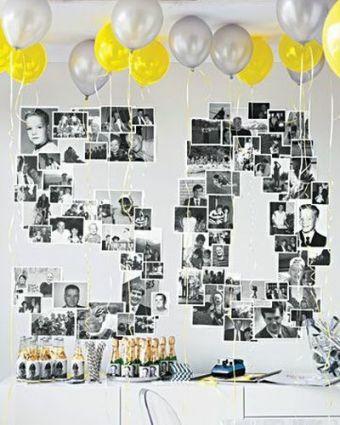 50th birthday party themes and old photographs fit together perfectly. 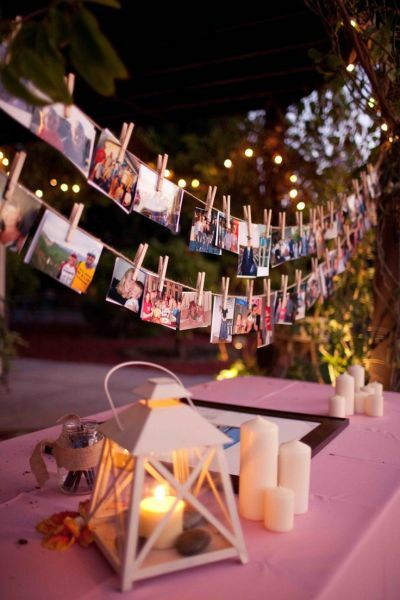 Draping pictures in a key spot is a neat way to get creative with the theme and highlight the good times. Going through old pictures is a fun thing to do as well as an uplifting decoration. 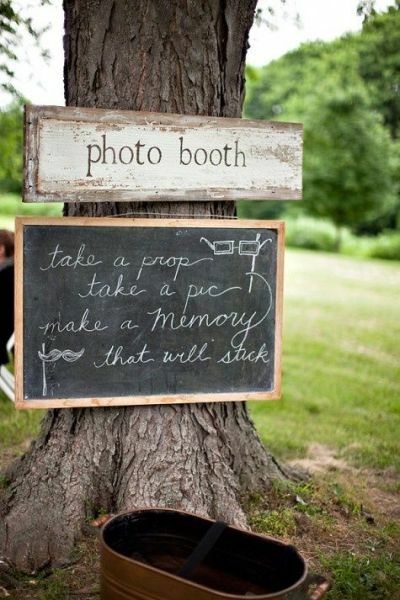 Another wonderful piece of theater is to opt for a photo booth to make future memories. Translating the honoree's personality into the perfect party theme can be a challenge, especially a milestone birthday. 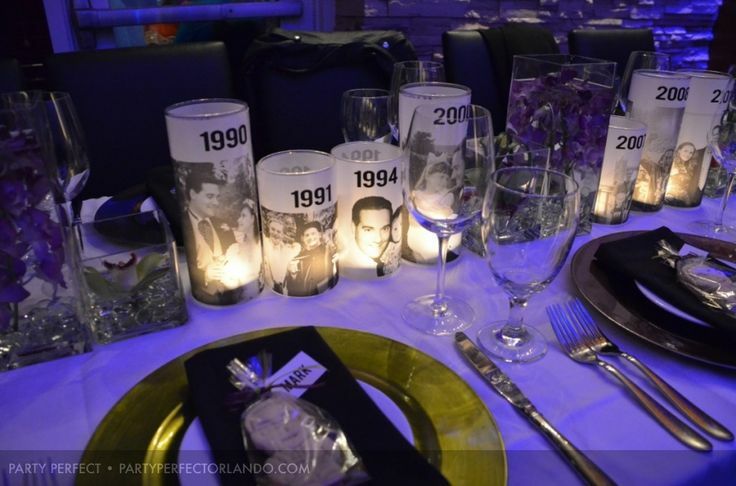 Once you have chosen the theme, arrange the decor around that idea, plan a menu, and throw an undeniable celebration of 50 years hitting all the high points in between. Celebrating what he or she loves most. 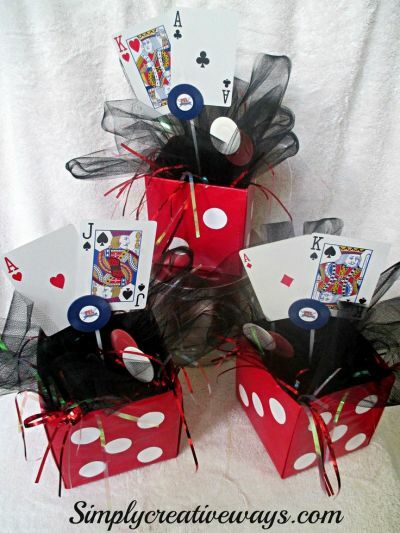 Here, they took the casino theme to the limit with dynamic color and decorative detail. 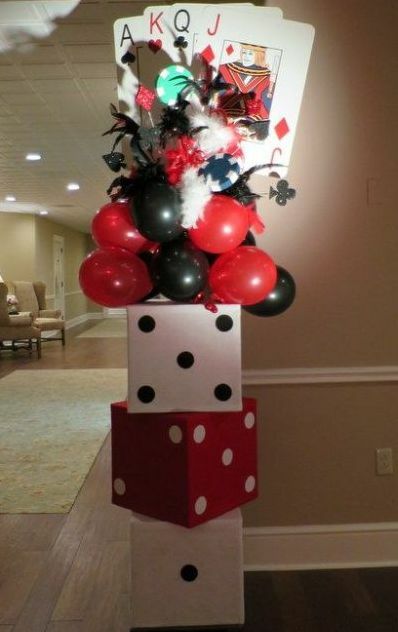 As luck would have it, everything relates back to the theme and the odds are in your favor for a successful party. 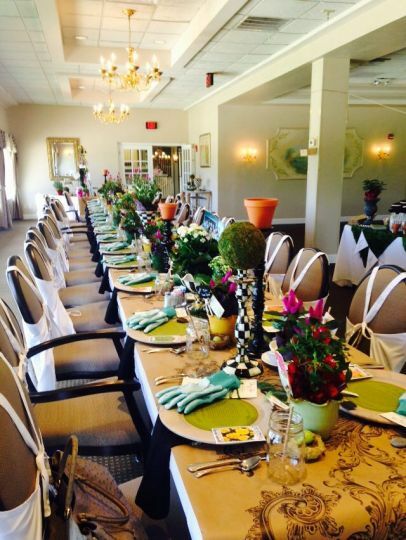 Let the love of the game take the lead when it comes to decorating a golf lover's party space. 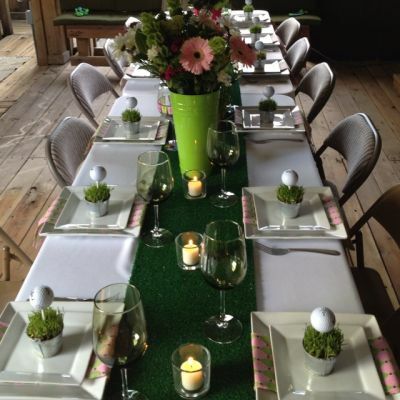 Golf reigns supreme here with the use of green turf as a table runner and the perfect placement of the golf ball favor. Race fans, start your engines. 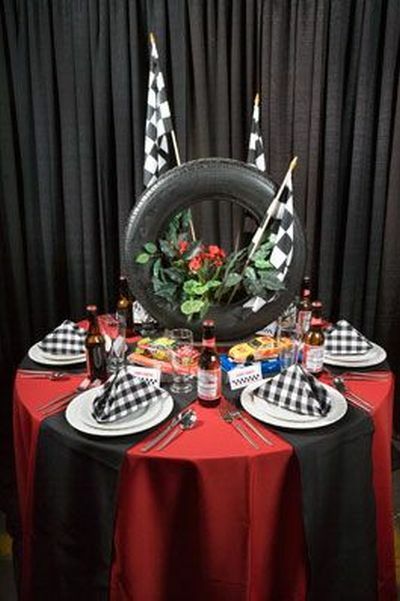 Here, the use of the checkered pattern drives every element of this tablescape to the winner's circle. 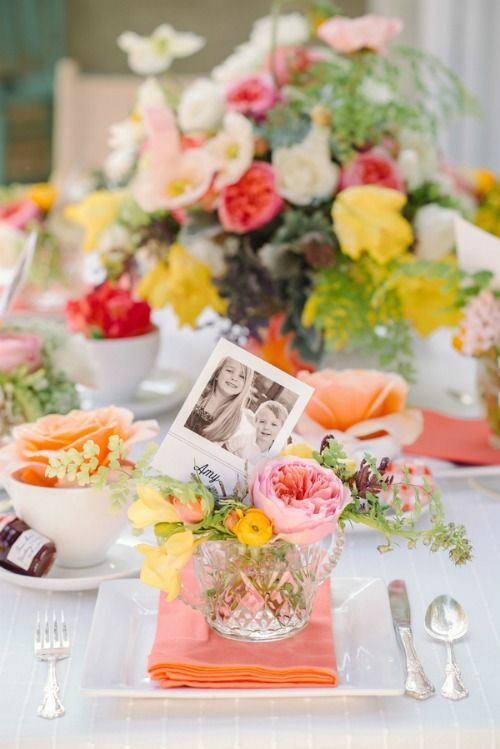 Gardening gloves, seed packets, flowers, candlesticks, and flower pots are all the texture and color needed to make this tablescape fresh and bright. The layers all work together to create a beautiful garden party. 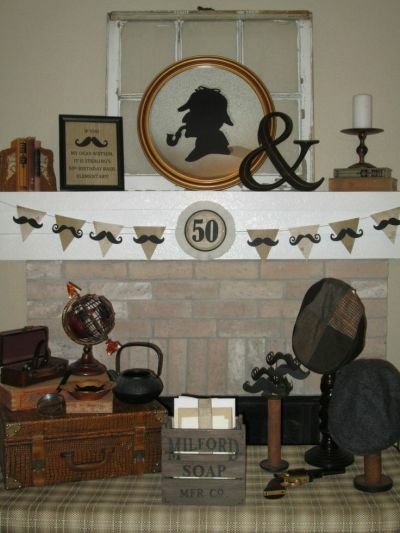 If your 50th birthday Honoree is intrigued by a good mystery, consider a Sherlock party full of surprises. It's all in the decorations, my dear Watson. Celebrating seasonal 50th birthday party themes. The fall season is a chance to celebrate a 50th birthday in glorious style. 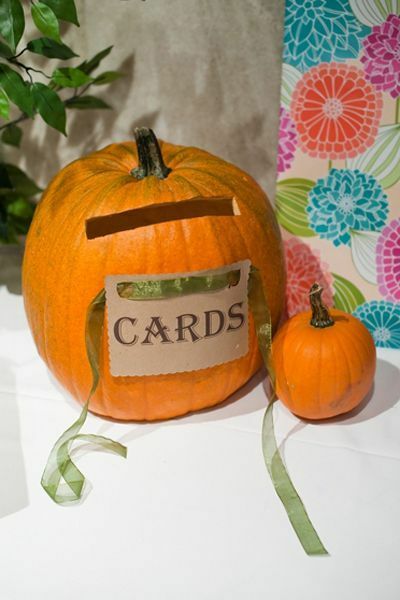 With pumpkins being the most popular sign of the season, set the scene with pumpkin power. 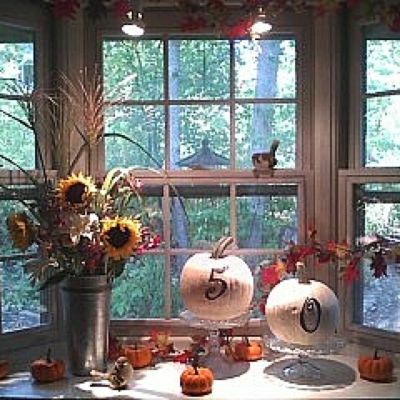 We love how the white washed pumpkins showcase 50, fit the autumnal theme, and add an unexpected element to the table. 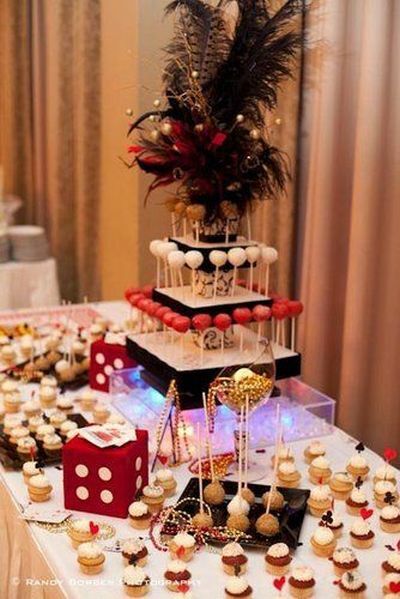 Continue kicking up the theme with an exceptional cake presentation and card collecting idea. Nothing can win us back to the delusions of youth more than a 50th birthday party celebrated at Christmastime. 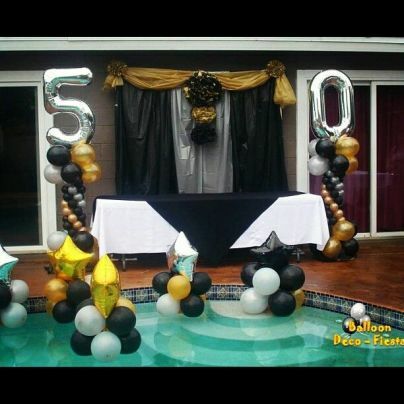 Because the house is decorated for Christmas, incorporate the spirit of the big 5-0 wherever you can. In the spirit of memories. 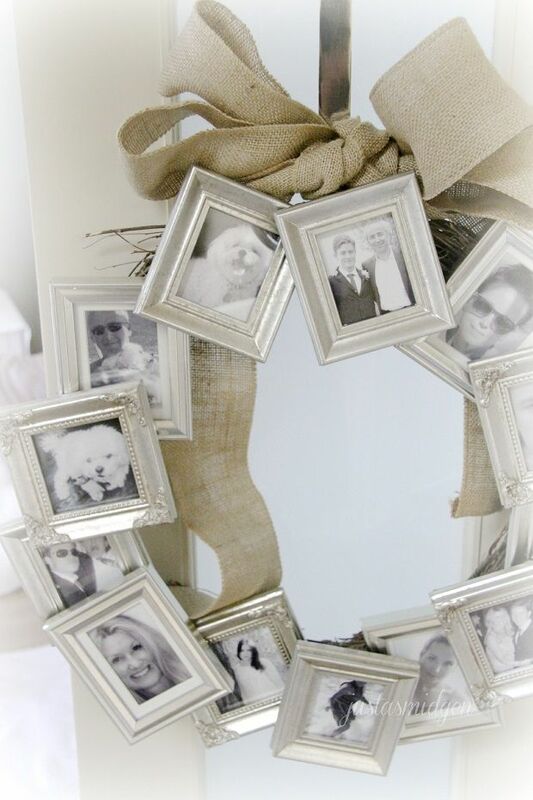 In addition to traditional Christmas ornaments, hang meaningful photographs of the honoree in tiny frames. This idea works equally well in a vintage wreath design. 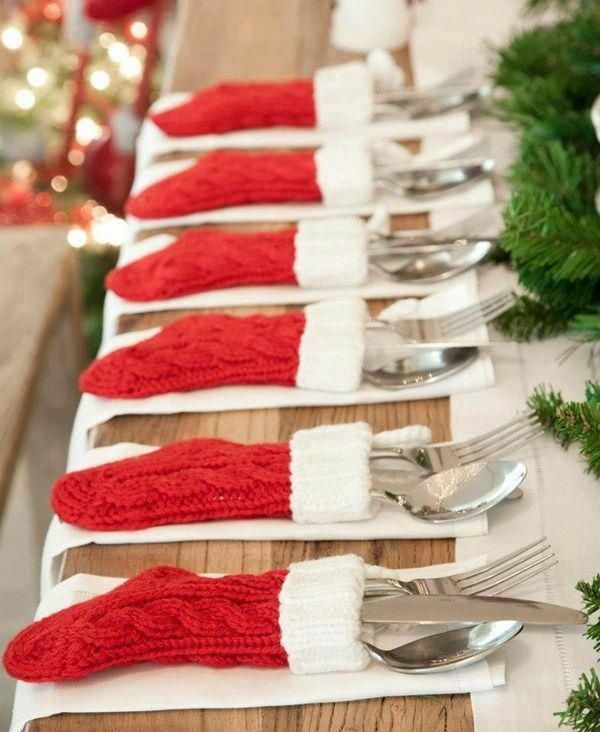 Small stockings stuffed with utensils will make a big impression at the table and add to the festive fun. 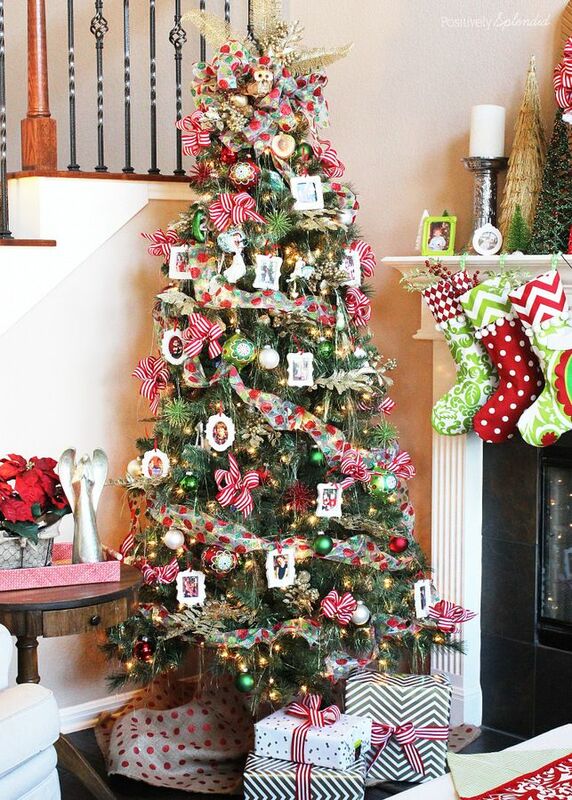 Deck the halls to bring 50th birthday party themes to life with an abundance of Christmas cheer. Happy 50th Birthday and Merry Christmas to all. Whether you prefer the drama of black and white or the innocence of white, the key is to make sure the wintry feeling is there. 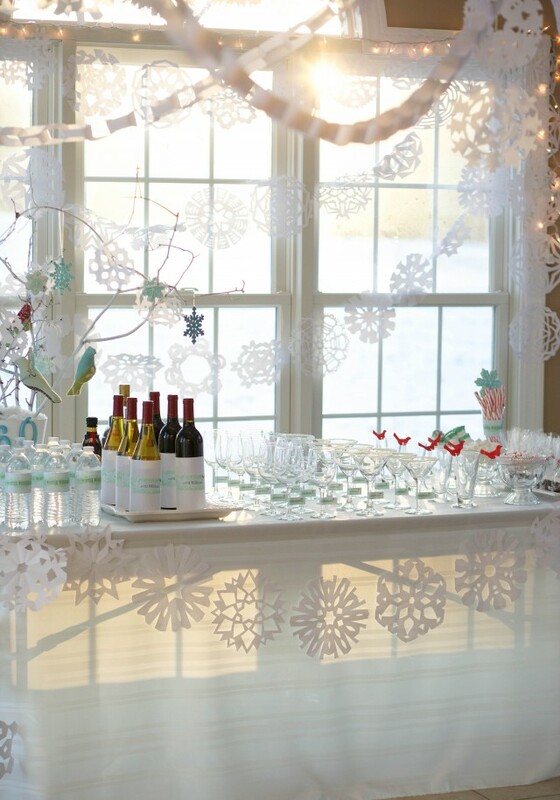 This is the time to dip glasses in sugar to resemble snow or place feathery fringe around the dinner plates. 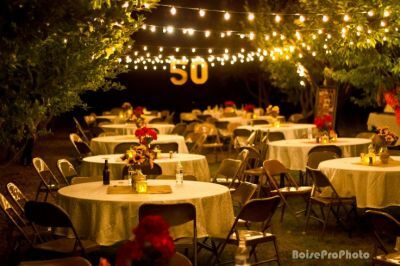 Springtime 50th birthday party themes give you the opportunity to make the most of the season when it is looking its best. Use the brilliant colors of spring as inspiration for flowers and other elements of decor. 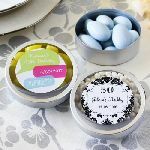 Using photographs is an ingenious way to accessorize the table setting and echo the sentiment of a 50th birthday party. 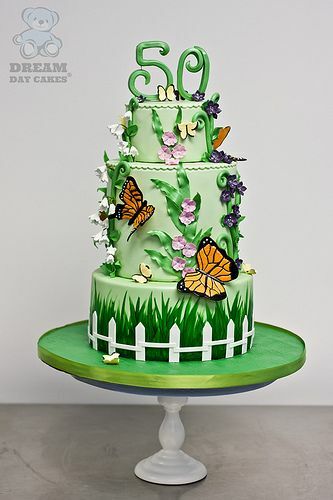 This 50th birthday cake is the perfect example of how springlike textures and colors can reinforce the occasion and the season.